Peripheral neuropathy (PN) is damage to or disease affecting nerves, which may impair sensation, movement, gland or organ function, or other aspects of health, depending on the type of nerve affected. Common causes include systemic diseases (such as diabetes or leprosy), vitamin deficiency, medication (e.g., chemotherapy, or commonly prescribed antibiotics including Metronidazole and the Flouroquinolone class of antibiotics (Ciprofloxacin, Levaquin, Avelox etc. ), traumatic injury, radiation therapy, excessive alcohol consumption, immune system disease, Coeliac disease, or viral infection. It can also be genetic (present from birth) or idiopathic (no known cause). In conventional medical usage, the word neuropathy (neuro-, "nervous system" and -pathy, "disease of") without modifier usually means peripheral neuropathy. Neuropathy affecting just one nerve is called "mononeuropathy" and neuropathy involving multiple nerves in roughly the same areas on both sides of the body is called "symmetrical polyneuropathy" or simply "polyneuropathy." When two or more (typically just a few, but sometimes many) separate nerves in disparate areas of the body are affected it is called "mononeuritis multiplex," "multifocal mononeuropathy," or "multiple mononeuropathy." Peripheral neuropathy may be chronic (a long-term condition where symptoms begin subtly and progress slowly) or acute (sudden onset, rapid progress, and slow resolution). Acute neuropathies demand urgent diagnosis. Motor nerves (that control muscles), sensory nerves, or autonomic nerves (that control automatic functions such as heart rate, body temperature, and breathing) may be affected. More than one type of nerve may be affected at the same time. Peripheral neuropathies may be classified according to the type of nerve predominantly involved, or by the underlying cause. Polyneuropathy is a pattern of nerve damage that is quite different from mononeuropathy, often more serious and affecting more areas of the body. The term "peripheral neuropathy" sometimes is used loosely to refer to polyneuropathy. In cases of polyneuropathy, many nerve cells in various parts of the body are affected, without regard to the nerve through which they pass; not all nerve cells are affected in any particular case. In distal axonopathy, one common pattern is that the cell bodies of neurons remain intact, but the axons are affected in proportion to their length; the longest axons are the most affected. Diabetic neuropathy is the most common cause of this pattern. In demyelinating polyneuropathies, the myelin sheath around axons is damaged, which affects the ability of the axons to conduct electrical impulses. The third and least common pattern affects the cell bodies of neurons directly. This usually picks out either the motor neurons (known as motor neuron disease) or the sensory neurons (known as sensory neuronopathy or dorsal root ganglionopathy). Polyneuropathies usually are caused by processes that affect the body as a whole. Diabetes and impaired glucose tolerance are the most common causes. Other causes relate to the particular type of polyneuropathy, and there are many different causes of each type, including inflammatory diseases such as Lyme disease, vitamin deficiencies, blood disorders, and toxins (including alcohol and certain prescribed drugs). Most types of polyneuropathy progress fairly slowly, over months or years, but rapidly progressive polyneuropathy also occurs. It is important to recognize that glucose levels in the blood may spike to nerve-damaging levels after eating even though fasting blood sugar levels and average blood glucose levels may still remain below normal levels (currently they typically are considered below 100 mg/dL for fasting blood plasma and 6.0% for HGBA1c, the test commonly used to measure average blood glucose levels over an extended period). Studies have shown that many of the cases of peripheral small fiber neuropathy with typical symptoms of tingling, pain, and loss of sensation in the feet and hands are due to glucose intolerance before a diagnosis of diabetes or pre-diabetes. Such damage often is reversible, particularly in the early stages, with changes in diet, exercise, and weight loss. Mononeuritis multiplex also may cause pain, which is characterized as deep, aching pain that is worse at night and frequently in the lower back, hip, or leg. In people with diabetes mellitus, mononeuritis multiplex typically is encountered as acute, unilateral, and severe thigh pain followed by anterior muscle weakness and loss of knee reflex. Those with diseases or dysfunctions of their nerves may present with problems in any of the normal nerve functions. Symptoms vary depending on the types of nerve fiber involved.In terms of sensory function, symptoms commonly include loss of function ("negative") symptoms, including numbness, tremor, impairment of balance, and gait abnormality. Gain of function (positive) symptoms include tingling, pain, itching, crawling, and pins-and-needles. Motor symptoms include loss of function ("negative") symptoms of weakness, tiredness, muscle atrophy, and gait abnormalities; and gain of function ("positive") symptoms of cramps, and muscle twitch (fasciculations). Toxic causes: drugs (vincristine, metronidazole, phenytoin, nitrofurantoin, isoniazid, ethyl alcohol, statins), organic herbicides TCDD dioxin, organic metals, heavy metals, excess intake of vitamin B6 (pyridoxine). Peripheral neuropathies also may result from long term (more than 21 days) treatment with Linezolid (Zyvox). Sometimes symptomatic relief for the pain of peripheral neuropathy is obtained by application of topical capsaicin. Capsaicin is the factor that causes heat in chili peppers. Relief up to 12 weeks is noted with high concentrations of capsaicin applied cutaneously. Local anesthesia often is used to counteract the initial discomfort of the capsaicin. More information is available in this review by the National Institute of Health. 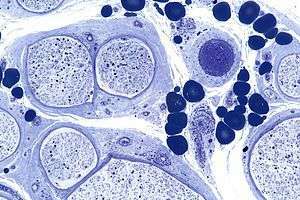 Some current research in animal models has shown that depleting neurotrophin-3 may oppose the demyelination present in some peripheral neuropathies by increasing myelin formation. There has been limited evidence shown to support the use of medicinal marijuana for neuropathic pain. 1 2 3 4 Richard A C Hughes (23 February 2002). "Clinical review: Peripheral neuropathy". British Medical Journal. 324 (7335): 466–469. doi:10.1136/bmj.324.7335.466. 1 2 3 4 Janet M. Torpy; Jennifer L. Kincaid; Richard M. Glass (21 April 2010). "Patient page: Peripheral neuropathy". Journal of the American Medical Association. 303 (15): 1556. doi:10.1001/jama.303.15.1556. PMID 20407067. 1 2 3 4 "Peripheral neuropathy fact sheet". National Institute of Neurological Disorders and Stroke. 19 September 2012. ↑ "neuropathy". Online Etymology Dictionary. ↑ Campellone, Joseph V. "Mononeuritis multiplex". MedlinePlus. Retrieved 24 March 2016. ↑ Ball, Derick A., DPM FACFAS. "Peripheral Neuropathy". NeuraVite. Retrieved 24 March 2016. ↑ Criado PR, Marques GF, Morita TC, de Carvalho JF (2016). "Epidemiological, clinical and laboratory profiles of cutaneous polyarteritis nodosa patients: Report of 22 cases and literature review". Autoimmun Rev. 15 (6): 558–63. doi:10.1016/j.autrev.2016.02.010. PMID 26876385. 1 2 3 Samson M, Puéchal X, Devilliers H, Ribi C, Cohen P, Bienvenu B, Terrier B, Pagnoux C, Mouthon L, Guillevin L (2014). "Mononeuritis multiplex predicts the need for immunosuppressive or immunomodulatory drugs for EGPA, PAN and MPA patients without poor-prognosis factors". Autoimmun Rev. 13 (9): 945–53. doi:10.1016/j.autrev.2014.08.002. PMID 25153486. ↑ HELLMANN, DAVID B.; LAING, TIMOTHY J.; PETRI, MICHELLE; WHITING-OʼKEEFE, QUINN; PARRY, GARETH J. (May 1988). "Mononeuritis Multiplex". Medicine. 67 (3): 145–153. doi:10.1097/00005792-198805000-00001. ↑ Lenglet, Timothee B.; Haroche, Julien. ; Schnuriger, Aurelie; Maisonobe, Theirry; Viala, Karine J. (May 2011). "Neurology". Medicine. 258 (7): 1321–1326. doi:10.1007/s00415-011-5931-2. ↑ Kaku M, Simpson DM (2014). "HIV neuropathy". Curr Opin HIV AIDS. 9 (6): 521–6. doi:10.1097/COH.0000000000000103. PMID 25275705. ↑ Vargas DL, Stern BJ (2010). "Neurosarcoidosis: diagnosis and management". Semin Respir Crit Care Med. 31 (4): 419–27. doi:10.1055/s-0030-1262210. PMID 20665392. ↑ Cacoub P, Comarmond C, Domont F, Savey L, Saadoun D (2015). "Cryoglobulinemia Vasculitis". Am. J. Med. 128 (9): 950–5. doi:10.1016/j.amjmed.2015.02.017. PMID 25837517. ↑ Vinik, AI; Erbas, T (2013). "Diabetic autonomic neuropathy". Handbook of clinical neurology. Handbook of Clinical Neurology. 117: 279–94. doi:10.1016/b978-0-444-53491-0.00022-5. ISBN 9780444534910. PMID 24095132. ↑ Chin, RL; Latov, N (Jan 2005). "Peripheral Neuropathy and Celiac Disease.". Current Treatment Options in Neurology. 7 (1): 43–48. doi:10.1007/s11940-005-0005-3. PMID 15610706. ↑ Rosenbloom, Mark; Tarabar, Asim; Adler, Robert A. "Vitamin Toxicity". Medscape Reference. Medscape. Retrieved 21 May 2013. 1 2 3 4 Cioroiu, Comana M.; Brannagan, Thomas H. (2014). "Peripheral Neuropathy". Current Geriatrics Reports. 3 (2): 83–90. doi:10.1007/s13670-014-0079-4. ISSN 2196-7865. 1 2 3 Azhary H, Farooq MU, Bhanushali M, Majid A, Kassab MY (2010). "Peripheral neuropathy: differential diagnosis and management". Am Fam Physician. 81 (7): 887–92. PMID 20353146. 1 2 3 Watson, James C.; Dyck, P. James B. (2015). "Peripheral Neuropathy: A Practical Approach to Diagnosis and Symptom Management". Mayo Clinic Proceedings. 90 (7): 940–951. doi:10.1016/j.mayocp.2015.05.004. ISSN 0025-6196. 1 2 3 4 5 6 7 8 9 Gilron, I; Baron, R; Jensen, T (April 2015). "Neuropathic pain: principles of diagnosis and treatment". Mayo Clinic Proceedings. 90 (4): 532–45. doi:10.1016/j.mayocp.2015.01.018. PMID 25841257. ↑ Gabriel JM, Erne B, Pareyson D, Sghirlanzoni A, Taroni F, Steck AJ (1997). "Gene dosage effects in hereditary peripheral neuropathy. Expression of peripheral myelin protein 22 in Charcot-Marie-Tooth disease type 1A and hereditary neuropathy with liability to pressure palsies nerve biopsies". Neurology. 49 (6): 1635–40. doi:10.1212/WNL.49.6.1635. PMID 9409359. ↑ "Statin Drugs May Increase Risk Of Peripheral Neuropathy". ScienceDaily. St. Paul, Minnesota. 15 May 2002. Retrieved 21 May 2013. ↑ "Statin Drugs May Increase Risk of Peripheral Neuropathy". AAN.com (Press release). St. Paul, Minnesota: American Academy of Neurology. 13 May 2002. Retrieved 21 May 2013. ↑ Cohen, JS (December 2001). "Peripheral Neuropathy Associated with Fluoroquinolones" (PDF). Ann Pharmacother. 35 (12): 1540–7. doi:10.1345/aph.1Z429. PMID 11793615. ↑ "Service-Connected Disability Compensation For Exposure To Agent Orange" (PDF). Vietnam Veterans of America. April 2015. p. 4. Retrieved 20 August 2015. ↑ Gonzalez-Duarte, A; Cikurel, K; Simpson, DM (2007). "Managing HIV peripheral neuropathy". Current HIV/AIDS reports. 4 (3): 114–8. doi:10.1007/s11904-007-0017-6. PMID 17883996. ↑ Nobile-Orazio E.; et al. (June 1992). "Peripheral neuropathy in monoclonal gammopathy of undetermined significance: prevalence and immunopathogenetic studies". Acta Neurologica Scandinavica. 85 (6): 383–390. doi:10.1111/j.1600-0404.1992.tb06033.x. ↑ Moore, RA; Chi, CC; Wiffen, PJ; Derry, S; Rice, AS (October 2015). "Oral nonsteroidal anti-inflammatory drugs for neuropathic pain". Cochrane database of systematic reviews. 10 (10): CD010902. doi:10.1002/14651858.CD010902.pub2. PMID 26436601. ↑ Derry S, Sven-Rice A, Cole P, Tan T, Moore RA (2013). "Topical capsaicin (high concentration) for chronic neuropathic pain in adults". Cochrane Database Syst Rev. 2 (2): CD007393. doi:10.1002/14651858.CD007393.pub3. PMID 23450576. ↑ Liu N, Varma S, Tsao D, Shooter EM, Tolwani RJ (2007). "Depleting endogenous neurotrophin-3 enhances myelin formation in the Trembler-J mouse, a model of a peripheral neuropathy". J. Neurosci. Res. 85 (13): 2863–9. doi:10.1002/jnr.21388. PMID 17628499. ↑ Hill, KP (June 2015). "Medical Marijuana for Treatment of Chronic Pain and Other Medical and Psychiatric Problems: A Clinical Review". JAMA. 313 (24): 2474–83. doi:10.1001/jama.2015.6199. PMID 26103031. ↑ Jin DM, Xu Y, Geng DF, Yan TB (July 2010). "Effect of transcutaneous electrical nerve stimulation on symptomatic diabetic peripheral neuropathy: a meta-analysis of randomized controlled trials". Diabetes Res. Clin. Pract. 89 (1): 10–5. doi:10.1016/j.diabres.2010.03.021. PMID 20510476. ↑ Pieber K, Herceg M, Paternostro-Sluga T (April 2010). "Electrotherapy for the treatment of painful diabetic peripheral neuropathy: a review". J Rehabil Med. 42 (4): 289–95. doi:10.2340/16501977-0554. PMID 20461329. Latov, Norman (2007). Peripheral Neuropathy: When the Numbness, Weakness, and Pain Won't Stop. New York: American Academy of Neurology Press Demos Medical. ISBN 1-932603-59-X. Committee on Standards; Practice Parameters; American Society of Anesthesiologists (2000). "Practice advisory for the prevention of perioperative peripheral neuropathies: an updated report by the American Society of Anesthesiologists Task Force on prevention of perioperative peripheral neuropathies". Anesthesiology. 92 (4): 1168–82. doi:10.1097/00000542-200004000-00036. PMID 10754638.